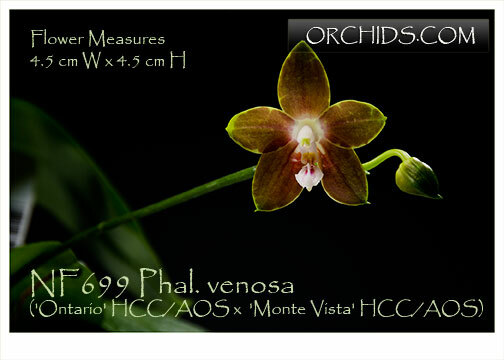 Not often available, this species is a result of a sibbing of our two best clones of Phal. venosa. The pod parent, 'Ontario', has the best flower form and 'Monte Vista' usually produces a multi-spiking habit. Expect mustard yellow to green-gold full-form flowers suffused with a heavy chestnut overlay, leaving a fine mustard-green picotee around all the segments and a distinctive white heart – some progeny from this sibbing have been so heavily overlaid with chestnut that they appear to be solid brown – others have shown a much stronger green background. 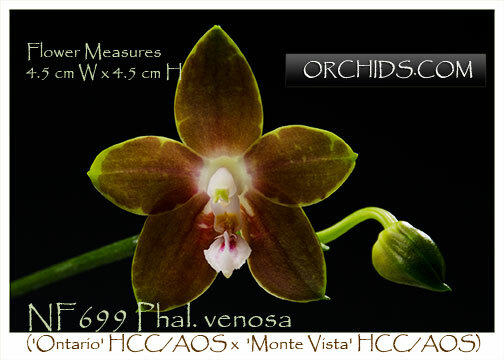 A must species for the collector and excellent for under-lights or windowsill growing ! Highly Recommended !